Things have turned ugly between a group of workers and the management on 19th July 2012 at the Manesar Plant of Maruti Suzuki India. Last year we saw long strikes at the same plant and production halts which costed a fortune to Maruti Suzuki, but this time it had crossed all the limits of ugliness. Awanish Kumar Dev, General Manager of Human Resource department of Maruti Suzuki has been burned to death in these clashes with his dead body damaged so badly that it was difficult to recognize him. In this clash, over 100 people have been injured and there have been over 91 arrests by the state police. The situation got tensed after suspension of worker over misconduct with a management personnel and things gradually turned violent with agitated workers. Such incidents are very unfortunate and does shake up everyone from the workers, management and even the industry as a whole. 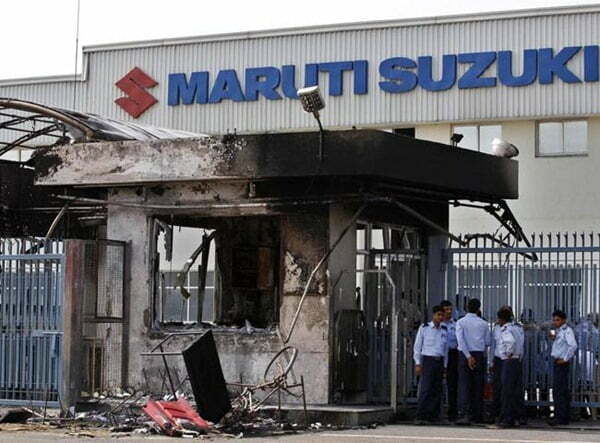 Production has been halted at Maruti Suzuki Manesar plant yesterday after the incident and it may take some time for things to become normal. The biggest loss in this violent incident is the life of an employee which can not be compensated. After last year’s labour unrest and loss of production, Maruti Suzuki has taken various steps to keep the work environment harmonious between the workers and management, but these efforts seems to have not worked to the fullest. We just hope that the situations get normal soon and these unfortunate violent situations don’t arise in any industry in future. With the capacity constrains and labour unrests every now and then, Maruti Suzuki has also approved the development of a new plant in Gujarat which will be developed in coming years to take some load off its Haryana plants in Gurgaon and Manesar. We will keep you updated on the further developments, stay tuned to Car Blog India for latest updates.